Around this time of year, I look for any excuse to trot out my comfiest, chunkiest sweaters and my favorite comfort-food classics. Yep, I’m talking about stews, roasts, soups and chilis, oh my. This recipe for Lentil Chili Sliders is guaranteed to become a one-pot wonder family favorite. The meal warms you up from the inside, and will keep you feeling full (lentils = slow carb heaven). 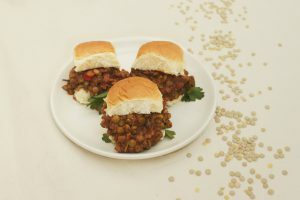 By adding the lentil chili in the middle of slider buns, you’ll have a (slightly messy) delicious dinner for the whole family. Hold the guilt— these sliders are also packed with nutrients. Lentils are an amazing source of fiber, copper, iron, B vitamins and more. Onions add phyto-chemicals and vitamin C, will help boost you and your babe’s immunity. Bell pepper, tomatoes and spinach add an extra nutrient boost, while cumin, lucuma, paprika and black pepper add delicious warmth and flavor to the dish. Trust us, you won’t be able to pass this one up. Lentils. Bell Pepper. Spinach. Tomato Sauce. Spices. This recipe is guaranteed to become a family favorite. In a small pot, combine green lentils and vegetable broth. Bring to a boil, and then reduce heat to a simmer. Allow to simmer for approximately 20 minutes, or until all of the liquid has been absorbed and lentils are tender. Remove from heat. In a large frying pan, combine onion, red bell pepper, garlic and olive oil. Sauté for 4-5 minutes, until onions and bell pepper are soft. Add in spinach, and sauté for another 2-3 minutes. Add in Worcestershire sauce, and mix well with the veggies, coating them well. Add in tomato sauce and lentils. Finally, add in cumin, lucuma, paprika, and black pepper, and mix in well. Allow the mixture to simmer for approximately 5 minutes. Serve immediately on it’s own, or in slider buns of your choice.